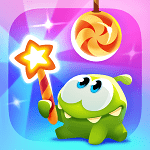 Om-Nom in Cut the Rope: Magic sets off on a new adventure of a magical land. Join him and turn Om-Nom into various forms. Use all new tricks to solve challenging puzzles and eat all the candies.